offers some of the best snorkeling in the world and interesting wildlife as well. The marine area of the park, which covers over 160,000 hectares (618 sq. miles), is home to about fish 700 species, 3 species of sea turtles and over 15 species of dolphins and whales. The forests on the island boast 147 bird specie, 38 mammals (recently 9 bats were added to this list!) and 39 amphibians and reptiles. Among them are at least 3 endemic species, animals that occur only on Coiba and nowhere else in the world. allow you to experience Coiba at its best. We visit up to four different reefs, walk two different trails and take you on a boat ride through the mangroves. You are likely to see endemic howler monkeys, agoutis and colorful birds in the forest. 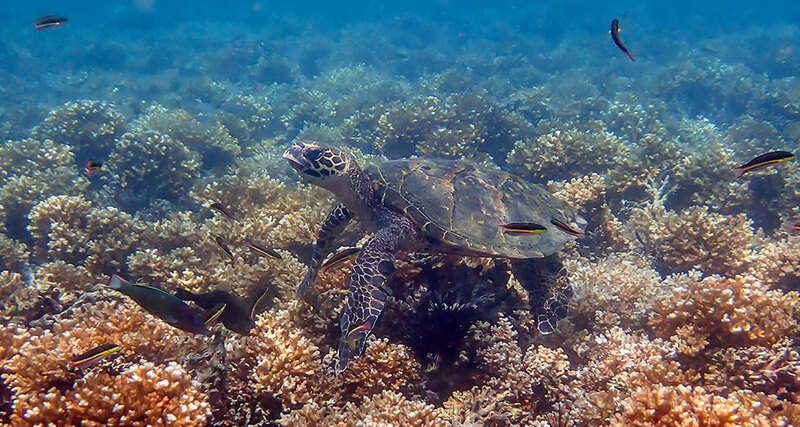 Coiba’s marine environment presents turtles, many types of colorful reef fish, and the harmless white-tip reef-shark around Coiba’s reefs. Aboard our boat we regularly observe dolphins (bottle-nosed and pacific spotted dolphins), and from July to September we also regularly meet Southern Humpback Whales.